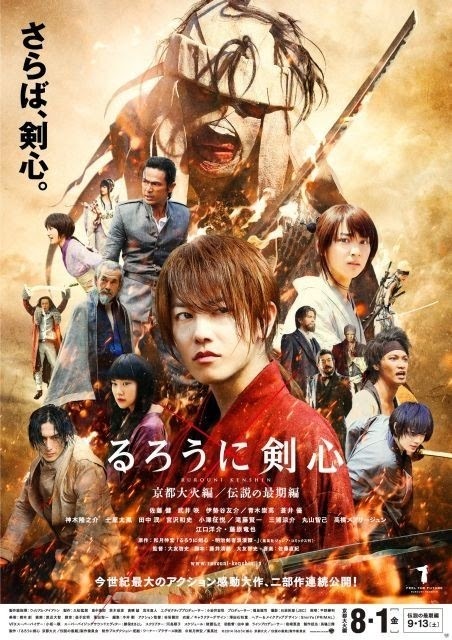 Kenshin Himura (Takeru Sato) goes up against pure evil Makoto Shishio (Tatsuya Fujiwara) who is attempting to overthrow the Meiji government. The fate of the country hangs in the balance as Kenshin Himura takes up the sword that he vowed to never draw again. Based on popular manga series "Rurouni Kenshin" written & illustrated by Watsuki Nobuhiro (published in Weekly Shonen Jump from September 2, 1994 – November 4, 1999). Filming began July 1, 2013 and finished December 27, 2013. Filming took place in Ibaraki, Yamagata, Kumamoto, Shiga, Hyogo, Kyoto, Nagano, Tochigi, Chiba, Kanagawa and Tokyo, Japan. More than 5,000 extras were used for the film.